Anju Singh, who was born in India and works at the National Institutes of Health, won an extraordinary ability green card for her scientific research. This is the second story in NBC News’ series “Immigration Nation,” an in-depth examination of immigration in America. One is a federal scientist with a Harvard pedigree and a body of ground-breaking research. The other is a burlesque performer with the looks of Rita Hayworth and a ground-shaking shimmy. Both women have been deemed “aliens of extraordinary ability” by Uncle Sam -- an elite cadre of immigrants who earn green cards, and a path to citizenship, by proving they are tops in their field. While the "extraordinary ability" route can be one of the fastest, persuading a faceless bureaucrat they deserve permanent residency can be a frustrating, expensive, even humbling experience for high achievers who may already be household names in their homelands. “The process is a nightmare,” said Anju Singh, the researcher with the National Institutes of Health, who was born in India and studied and worked in the U.S. for nearly a decade before she pursued the coveted green card granting permanent U.S. residency. The payoff, though, is something many immigrants with less impressive resumes can only dream about. Fewer than 4,000 extraordinary ability EB-1A green cards -- which don’t require a job offer from an American sponsor -- were approved last year. A third of the applications were rejected, according to U.S. Citizenship and Immigration Services. Have an Oscar, Nobel, Pulitzer or Olympic gold medal? Getting the card should be a breeze. But for other A-list artists, athletes, scientists, educators and entrepreneurs, reams of documentation are needed to show they meet at least three of 10 criteria for the program -- from awards and media coverage to high salary and membership in elite groups. May was touring the U.S. on a one-year visa when she decided to apply. Over four months, she compiled a 2-inch-thick dossier to demonstrate burlesque was an art form and that she had made a unique contribution. The file she submitted in December 2010 had clippings from papers around the country, tape of her appearance on a “Real Housewives” franchise, box-office receipts and hard-won letters of recommendation from producers and venue owners attesting that she is the creme de la Can-Can. “It’s hard to ask for favors, especially from people you don’t know too well,” May said. While Miss Universe can land a green card in a matter of weeks, this Golden Pasties winner had to wait more than a year and a half because her lawyer left her birth certificate out of the application and the adjudication officer kept sending requests for more evidence. “I was a wreck, thinking at any minute they’re going to tell me you have to leave the country," she said. "It’s so hard to live your life that way. What do I do if I get kicked out? If I go back to Canada, I’ll have to get a desk job.” After $10,000 in legal fees, May got her ego-boosting green card in August. Singh had a shorter but similarly stressful wait. After attending veterinary school in India, she came to the U.S. in 2003 for graduate studies. She earned a doctorate in immunology in five years and trained at the Harvard School of Public Health. Things got complicated when her husband was laid off. As a non-resident, he was ineligible for unemployment benefits and dependent on his wife’s visa, which could have made it harder for her to find employment sponsors. She also was pregnant when she decided to apply for a green card early last year. Between bouts of morning sickness, she badgered big-name scientists who had cited her work to give her recommendations and began reviewing research to satisfy an application criterion. Among the challenges: translating her biggest achievements -- isolating novel markers to identify stem cells that make bone, which could one day lead to disease cures -- in a way that would impress an adjudicator with no scientific expertise. Soon after giving birth, she received a letter from the government. There was no green card inside; they wanted more evidence, and a guarantee she would continue working in her field, which bridges basic lab research and clinical medicine. Three months later came word she was approved. "I was so happy, I couldn't sleep," Singh said. "I was thinking, 'I'm really extraordinary.' It was an amazing feeling." 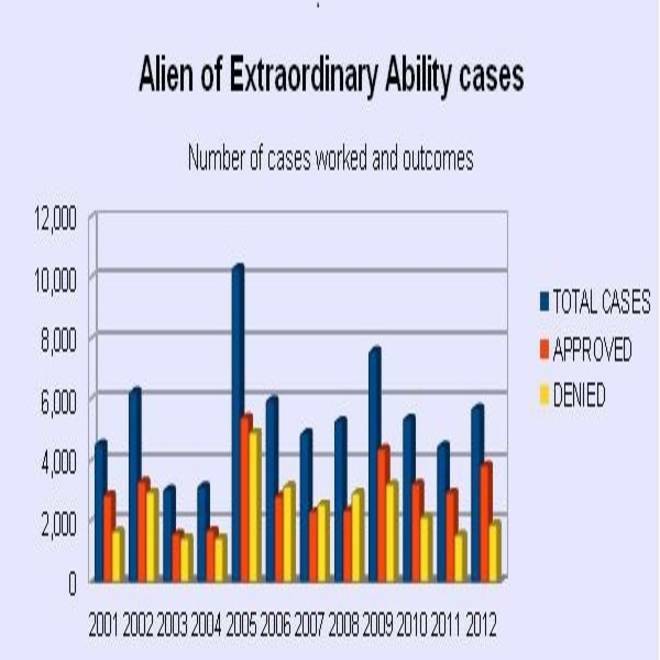 While statistics show the percentage of applications approved hit a decade high last year, some immigration lawyers think it's actually getting more difficult to make cases, with frequent requests for more evidence that underscore the subjective side of the process. Jeff Goldman, who practices in Cambridge, Mass., said he had to get the National Basketball Association commissioner's office involved after the feds expressed skepticism about the worthiness of Cleveland Cavaliers forward Omri Casspi, who stars in cereal commercials in his native Israel, was a first-round draft pick and was named to the NBA's all-rookie team. "We have seen over the years it's harder to get these cases approved," said Michael Wildes, a lawyer who helped supermodel Gisele Bundchen and golfer Greg Norman obtain green cards. "We've seen the government go through (applications) with a surgical knife." Adjudicators go from screening ballerinas to biologists. While there are guidelines, "in practice, there's a big standard deviation," said Cletus Weber, an attorney from the Seattle area. Sean Yazbeck won an extraordinary ability green card for his entrepreneurship and parlayed it into a spot on Donald's Trump's "The Apprentice." One of his clients, German mobile-technology entrepreneur Cyriac Roeding, won approval in a few months in 2007 and went on to launch the hugely successful startup Shopkick. The wait was far longer for Sean Yazbeck, a British phone-network engineer who got his green card in 2005 and went on to win Donald Trump's "The Apprentice." "For me, it was a very long, sweaty four years of waiting and waiting," he said. Well-credentialed foreigners who don't think they qualify for EB-1A, or the closely related EB-1B “outstanding professors or researchers” category, can seek green cards in the less-stringent “national interest waiver” category. That has its own set of requirements, and applicants from China or India face a backlog. Those who don't meet the standard for a waiver typically must find a full-time permanent position with a U.S. employer that can demonstrate that it could not find a qualified American for the job. Most lawyers said if a client is rejected for an extraordinary green card, it doesn't pay to appeal. Singer Celine Dion's bodyguard and driver, Nick Skokos, was turned down in 2009 after immigration officials determined he was a little too ordinary. He sued, but the courts ruled against him. He remains in the U.S. on a non-immigrant work visa, with no path to citizenship. "For Nick, the case was never about whether he had permission to be in the United States or not," said his lawyer, Luther Snavely. "Nick just loves the U.S. He wanted to become a lawful permanent resident and then a U.S. citizen, and he felt very strongly about it." Extraordinary ability green cards must be renewed after 10 years, or the holder can apply for citizenship in about five years. Yazbeck did it and is naturalized. Roeding and Singh haven't decided whether to seek citizenship. May, though, is counting the days until she can file. After visiting every state except Michigan, she's sure she wants to twirl her tassels here forever. "It's a beautiful country, and the people are amazing," she said.